Sakura Reflection (P*Light Slayer Remix)'s jacket. 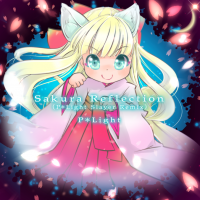 Sakura Reflection (P*Light Slayer Remix) is a remix of Sakura Reflection, from REFLEC BEAT. Sakura Reflection (P*Light Slayer Remix) is sampled in 月光乱舞's GRAVITY chart, from SOUND VOLTEX III GRAVITY WARS. Sakura Reflection (P*Light Slayer Remix) is a song part of the SOUND VOLTEX II -infinite infection- Production Confirmation Commemorative Remix Contest (SOUND VOLTEX II -infinite infection- 作決定記念 リミックスコンテスト). It was added to SOUND VOLTEX II -infinite infection- at release date. According to P*Light, Sakura Reflection (P*Light Slayer Remix) was inspired by one of his songs, NINJA, from the album samurai DANCEHALL. Sakura Reflection (P*Light Slayer Remix) is one of the songs in Part 6 of FLOOR INFECTION. During its periods of availability, it can be unlocked in the REFLEC BEAT series by playing 5 rounds of the corresponding SOUND VOLTEX series game to raise the infection level to Level 2 MAX. For more information on the dates it can be unlocked, please see the event page. Sakura Reflection (P*Light Slayer Remix) is the first remix from a FLOOR contest to be part of the FLOOR INFECTION event. Fittingly, Sakura Reflection (P*Light Slayer Remix) was crossed over to the REFLEC BEAT series, where the original Sakura Reflection originated from. This page was last edited on 29 October 2018, at 20:07.